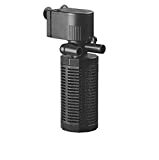 Each model is supplied with high-quality replaceable filter sponges included, complete with suctions caps for attaching to the side of your tank and detailed English instructions. This entry was posted in Aquatics and tagged AP1200L, Aquarium, Filter, FILTRATION, Hidom, Internal, Pump by One Boutique. Bookmark the permalink.